For those who know me, I am quintessentially the Type A personality that is driven, motivated, and tenacious. My thirst for knowledge is complimented by a love of planning. I think about things, a lot. Although, it rarely takes much time for me to reach a conclusion or make a decision. The acquisition of the lovely 36" four-shaft Leclerc Nilus loom back in April set off a very interesting and ultimately rewarding string of events. First, it was nice to have a second, smaller back up loom to the 56" Macomber. 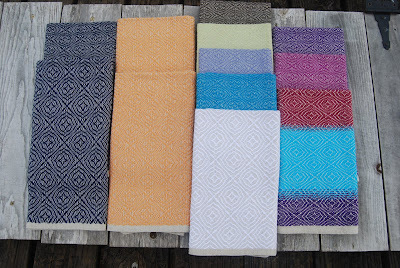 It solidified my desire to have a loom dedicated essentially to tea towels, place mats, napkins, and baby wraps. This freed up the bigger loom for blankets, wide fabrics for clothes (and ponchos), and all manner of interesting things. Secondly, it had a sectional warp beam. At first, I failed to appreciate what an asset this was. My initial response was to recognize it was regarded as a premium upgrade, but this was tempered by my lack of knowledge and experience with one. My friend in town who has a sister to my Macomber loom has a sectional beam on hers. When I asked her about it one time, she stated she used it like a plain beam when she warped. So, I basically knew it required a different technique and special equipment to warp sectionally, but I would be able to warp it as I did a plain beam. This sectional beam piqued my curiosity. When I refurbished the loom (it had been stored in a barn for quite some time), I decided to keep the sectional beam and bring it back to life, too, even though I could have removed the rakes attaching it to a plain beam, save myself a good bit of sweat and a couple hundred of dollars for the metal section pieces, and call it a day. Once the loom was up and running, I warped it as though it had a plain beam because I did not have the equipment to do anything else. 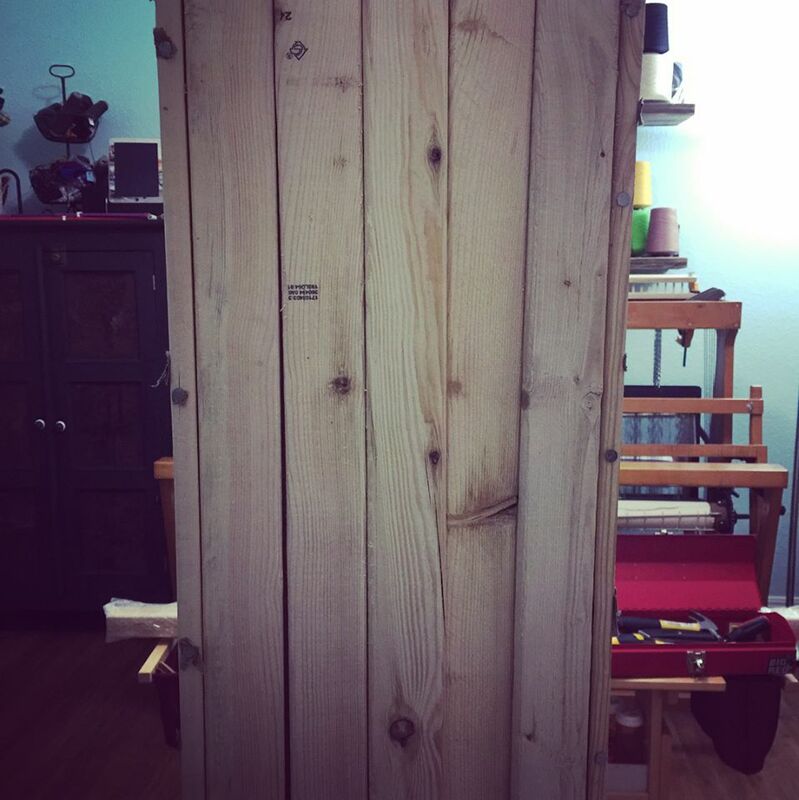 My research showed I needed spools, a spool winder, a spool rack, and a tension box. Those things were expensive, individually and collectively. 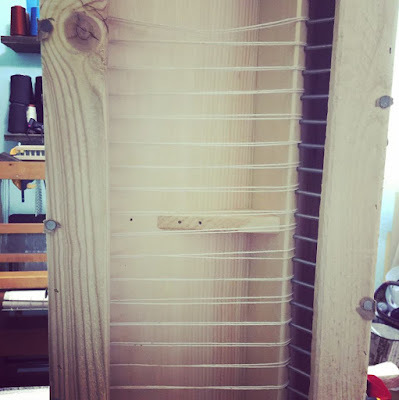 While I waited for my daughter's piano recital to begin one evening, about a month after I got the second loom, someone posted an older Leclerc tension box with a yardage meter for $115. New the box alone is $162 with a meter going for $114. The primary difference between the one I found and a new one was it had three dowels, instead of four. Handywoman made me a red oak one for $5! 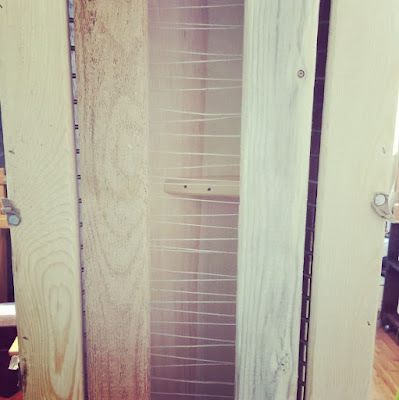 The second time I warped the Leclerc, I used my warping mill to prepare a chain of 40 ends that I fed through the tension box, one 2-inch section at a time. This was an extremely time consuming way to warp sectionally; however, the benefits of sectional warping were abundantly clear: 1) I did not require a helper to stand at the front of the loom to keep tension on the tail, while I beamed the warp; 2) the tension was even and perfect going onto the loom; and 3) it was so much easier! In a nutshell, I was sold. Thereafter, I devoted myself to slowly acquiring each piece of equipment necessary to be able to warp sectionally. 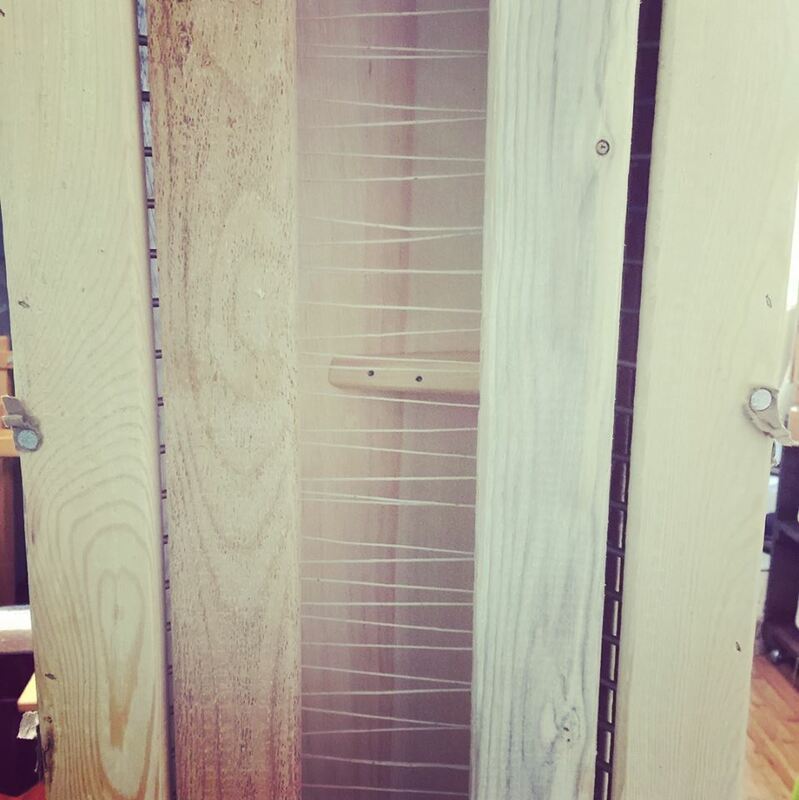 Handywoman made me a custom spool rack. I bought cardboard spools. Finally, I saved enough money to splurge on a double ended spool (and bobbin) winder with tensioner and meter. 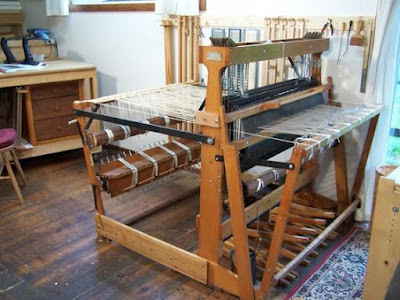 With that, I was fully prepared to warp sectionally; however, by that time, I had sold the Leclerc to a very dear friend and no longer had a loom with a sectional beam. 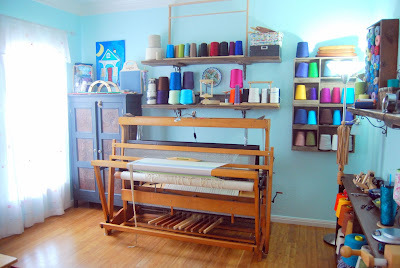 My plan prior to selling the loom was to convert my Macomber to a sectional beam or add one to it. In July, a Leclerc Colonial loom arrived for one of our very good friends. We offered to store it for her while she is overseas for the next couple of years, but as it was pre-owned, we wanted to put it together to ensure we had all the pieces for it. After it came together, we realized it came with rakes with 1-inch sectional pieces to convert the plain beam to a sectional beam. Our friend graciously offered to allow me to use the rakes on my loom, but her beam is 60" long and mine is 56" long. To use them, I would have to trim them. I simply did not want to do that. The easiest thing to do would have been to order the Leclerc rakes and attach them to my plain beam. I actually debated this option extensively, but ultimately decided against it. 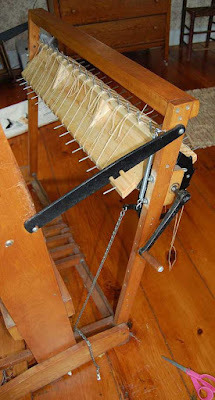 My thought process was three-fold: A) while I love Leclerc (having owned two of their looms), I was hesitant to adulterate the Macomber loom with something other than Macomber parts; B) I would still have to modify the pieces to fit my beam; and C) I wanted to keep my options on warping open. Part C was complicated and the most expensive option because it required me to keep all the equipment I had for plain warping (essentially a cone stand and a Glimakra warping mill that are worth a solid $600 together for resale and much more retail, not to mention a manual bobbin winder that was rendered redundant with the purchase of the double-ended spool winder with attachments) AND additional equipment dedicated for sectional warping (as mentioned above: spools, spool rack, double ended spool winder, and tension box). To give you an idea of what all stuff costs new, the Woolery has a sectional warping kit with all those things together for $990. As I debated which route I would follow, I researched the advantages of a double beam system and realized I would be able to do double weave by pulling threads from each of the beams at the same time into a single fabric. This is typically done where different warp threads are employed with variable elasticity. One beam houses the more elastic warp, while the other beam holds the less elastic warp, enabling an even tension between the two. Double weave was not something on my radar, but I like having options. I also looked at what I weave. When I do blankets, I rarely do more than two at a time. Thus, my warp is no more than five or six yards long. While there is waste in either way of warping, I find there is more waste with sectional weaving because one must load the spools before pulling from them, and I add a bit of cush to ensure I have enough on each spool to satisfy my warp. With plain weaving, there is less of a cushion because the warping mill measures out the exact length of each and every warp thread. With projects requiring fewer yards of warp, the percentage of cushion on each spool is greater, which means there is more waste. 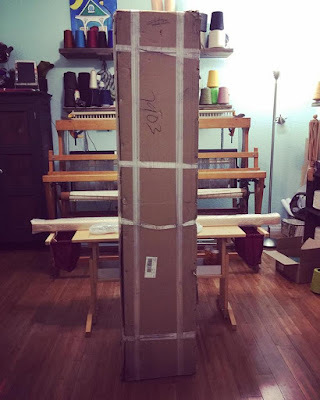 In terms of numbers, it makes more sense to me to warp projects requiring less than ten yards of warp on a plain beam and use the sectional for projects requiring more than ten yards of warp. I realize the cost of the accumulated waste over twenty years will probably be less than the actual cost of my keeping both sets of equipment, but I was looking at it from the perspective of future monies spent, rather than monies already spent. As I was down to one loom, as well, I wanted that loom to be as flexible as possible. Eventually, I would love to acquire a second Macomber, a 32" with up to 12 harnesses and a sectional beam, but solid second-hand looms within those parameters are very hard to find. My husband is resigned to our actually purchasing a new one directly from Macomber in a few years. Also, I have firmly decided to resist the call of any other loom, not a Macomber 32" without, at least, 8 harnesses. You can quote me! The second easiest thing to have done was to order a sectional beam from Macomber and swap it out with the existing plain beam. The major problem with that option was where to store the beam I was not using. The are long, large, and very heavy. The third option was to acquire a second beam and attach it below the original one, which would require a second brake and a double back beam. After visiting with Meredith at Macomber in September, that is exactly what I decided to do. As they build these beams only during certain months of the year, and they had just completed building their last batch, she advised they would not work on any beams again until November. I was happy to wait because the decision was made and the order paid for! I am 5'6" tall, and the box was taller than me. It weighed well over a hundred pounds. It took two of us to get it into the house. Tearing the box off revealed a wooden crate... Removing a few of the slats exposed a beautiful 1-yard in diameter sectional beam! The pieces for the new brake and to attach the beam were readily identifiable and accounted for; however, Macomber also sent a piece of maple 2-inches x 2-inches and 61 inches long. I had no idea what it was or what it was for. It arrived in its own tube container. 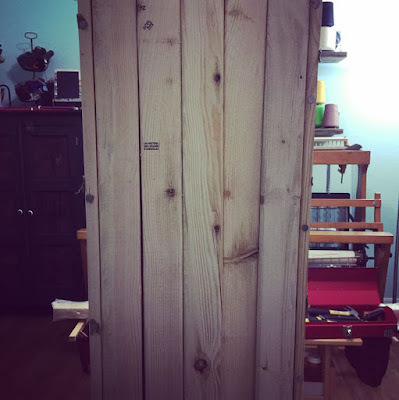 Checking my order, I discovered I had also purchased a second back beam, which would allow me to double weave. A bit of research revealed this piece of wood attaches to the back beam after the bottom beam is warped to keep the threads coming off the respective beams separate until they reach the heddles. That was all well and fine. Of note: in my brief study last night, I came across a Schacht article on weaving with two tensions with a double back beam. It was a bit dry, but at the bottom of the page was a paragraph bearing the title: "Turning a draft in brief." You can turn a draft 90 degrees for the same woven appearance. To do this, the threading becomes the treadling, the treadling becomes the threading, and the tie-up is used sideways. For example, if you turn an overshot draft, you will thread the pattern and the background threads in the warp and just weave with background threads in the weft. This means that weaving proceeds quicker because just one shuttle is used. Be sure to include the tabby picks in the treadling when you turn the draft for the threading. In five sentences and 90 words, that brief paragraph set my mind to spinning. I love overshot, although I find it fiddly, as it requires the use of two alternating shuttles to achieve the pattern, which slows down the weaving considerably. However, in warping with the two color threads and using one color for the weft and still weaving an overshot pattern is possible, the use of both beams in the same project is worth every single penny! I was so besotted with the prospect, visions of the possibilities invaded my dreams last night! I cannot remember the last time I was so excited about something!